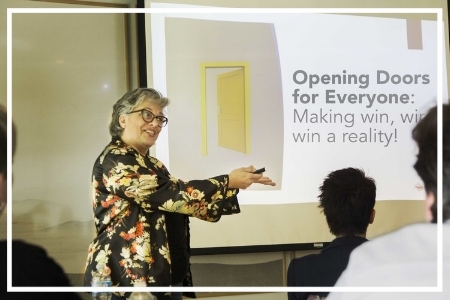 Opening Doors for Everyone is a program dedicated to providing businesses in Nova Scotia the essential tools and resources to become fully accessible and compliant with the NS Accessibility Act! Our presentations are free and province-wide. Why does your business need ODE? Our presentation addresses disability awareness, the new Accessibility Act in NS that will impact your business, and the government grants/funding program available to help cover costs of any improvements and/or further training. The NS Accessibility Act states that all businesses must be fully accessible by 2030. Read more about the bill here! Learn more about available grants and apply now! – Courtney McNutt; R.D. Chisholm Ltd.
"Thank you for hosting an amazing event... The presentation was outstanding and very helpful"
- Word Right Career & HR Consulting Inc.
Commencing April 2018, nationally recognized NGO, reachAbility Association will begin providing an accessAbility roadshow to businesses across Nova Scotia! These customized training modules will provide Nova Scotia based businesses new knowledge to aid in discovering the ease of inclusion in the workplace! Meet the experts, learn about new legislation, and access financial supports that ensure your business welcomes everyone! Join us in bringing together P3 stakeholders with a similar goal of making Nova Scotia the most accessible province in Canada! ODE will cover the following topics, ensuring attendees leave with a comprehensive tool kit of resources available while providing straight forward answers to your inclusion questions and addressing your business needs . OPEN YOUR DOORS TO EVERYONE!